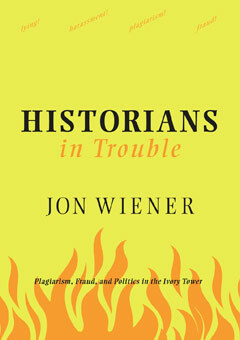 Available for the first time in paperback after being widely reviewed and discussed upon its hardcover publication, Historians in Trouble is investigative journalist and historian Jon Wiener’s “incisive and entertaining” (New Statesman) account of several of the most notorious history scandals of the last few years. Focusing on a dozen key controversies ranging across the political spectrum and representing a wide array of charges, Wiener seeks to understand why some cases make the headlines and end careers, while others do not. He looks at the well publicized cases of Michael Bellesiles, the historian of gun culture accused of research fraud; accused plagiarists and “celebrity historians” Stephen Ambrose and Doris Kearns Goodwin; Pulitzer Prize winner Joseph J. Ellis, who lied in his classroom at Mount Holyoke about having fought in Vietnam; and the allegations of misconduct by Harvard’s Stephan Thernstrom and Emory’s Elizabeth Fox-Genovese, who nevertheless were appointed by George W. Bush to the National Council on the Humanities.